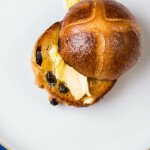 Well, it took a few attempts but I think we now have a pretty decent hot cross bun recipe sorted! This is something I have made a few times before but didn’t have a recipe written down for, so it has been a while! As is often the case in this situation, I had some ideas on the type of bun I wanted to make but did quite a bit of research first, both in books and on the internet. 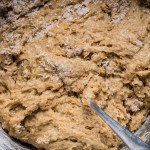 My ‘go to’ for anything yeasty is always Richard Bertinet and Dan Lepard, seriously good bakers who have given me much inspiration and information over the years. 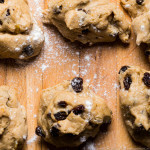 The one thing I did discover looking at various recipes is that the amount of fruit used varies hugely from around a quarter of the weight of flour to half. There are lots of other variations too, the spicing, the liquid, type of fruit and so on. It is all about using a recipe as a guide and making it suit your needs and tastes. I think making marmalade a few weeks ago had got me firmly on a citrus kick so orange and cinnamon were my flavour choices. One thing that did take me a bit by surprise was how much spice you need to really get the flavour coming through – I used a combination of mixed spice and ground cinnamon, a total weight of 19g! 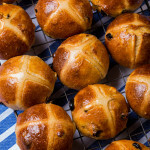 Wet, sticky doughs are a challenge but do persevere, the resulting buns are well worth the effort and are an entirely different product to the supermarket mass-produced norm. 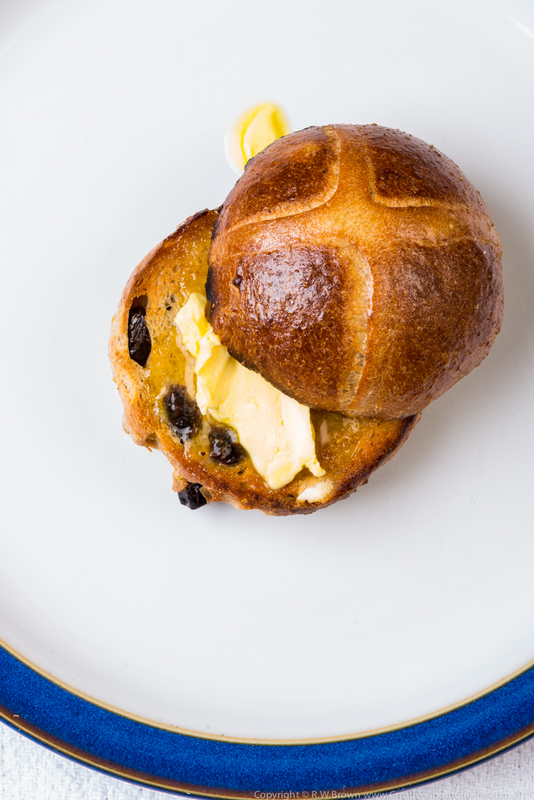 Toasted with lashings of good farmhouse butter and a cup of coffee seems a great way to start the day. 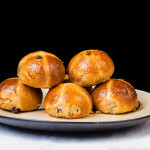 In the photos that accompany this post, the last three are of the third set of buns I tried; extra yeast, more spice, more fruit and a slight increase in the sugar gave me the result I was looking for! Start by making the paste for the crosses; sift the flour and salt into a small bowl, make a well in the centre and pour in the oil. Using a fork or small whisk, start adding the water gradually. Begin wit a couple of tablespoons and draw the flour in from the edges. You want to end up with a smooth paste that can be piped. The consistency should be like thick yoghurt. Cover and leave to one side. As the flour fully hydrates you may need to add little more water to thin before using. 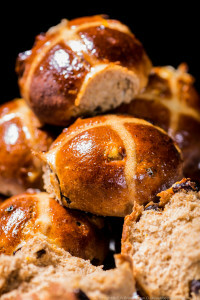 For the buns, warm the milk to around 35℃ and pour a few tablespoons over the yeast to start it working. 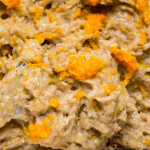 Sift all the dry ingredients into a mixing bowl either for hand mixing or on a stand mixer. 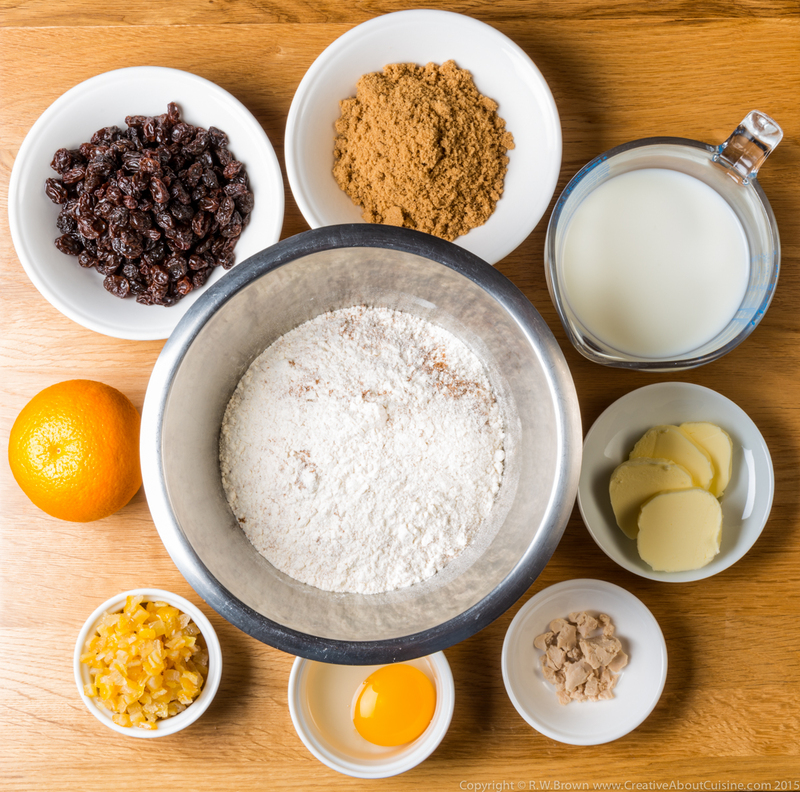 Add the dried fruits and mix through the dry ingredients separating any clumps of fruit. Grate the zest from the orange directly into the bowl. Once the yeast is starting to bubble start to work the wet ingredients into the dry mix. 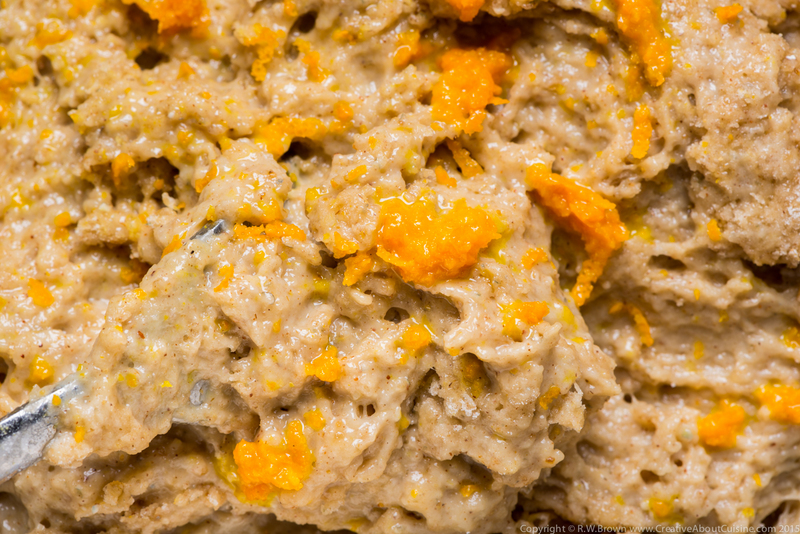 Add the yeast mix and then beat the egg and melted butter into the remaining milk before adding this to the dough. 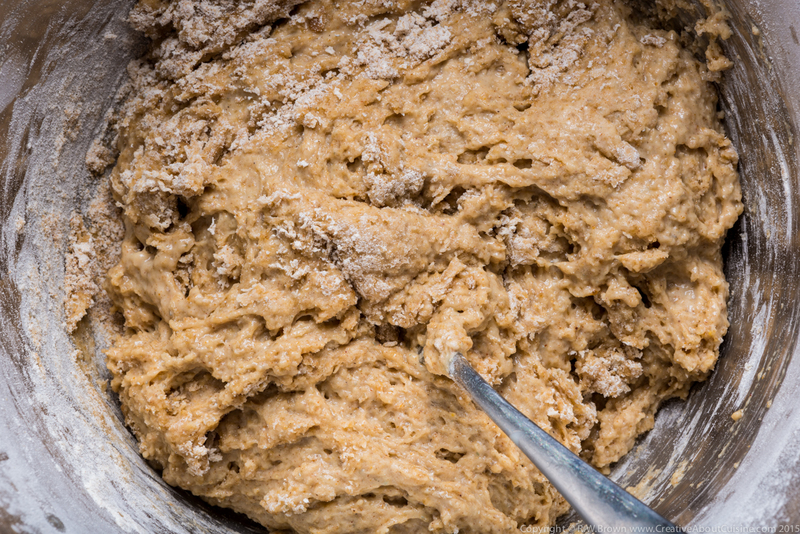 If mixing by hand start stirring in with a spatula before turning out onto a floured surface to knead. If using a mixer keep on a low speed, 1/2 on a KitchenAid for 6 minutes. 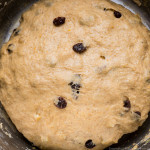 The dough is fairly wet and sticky so hand kneading is more challenging but the key is to avoid the temptation to add a lot more flour. I find using a plastic dough scraper helps with the stretching and folding as well as for scraping the dough off your hands. 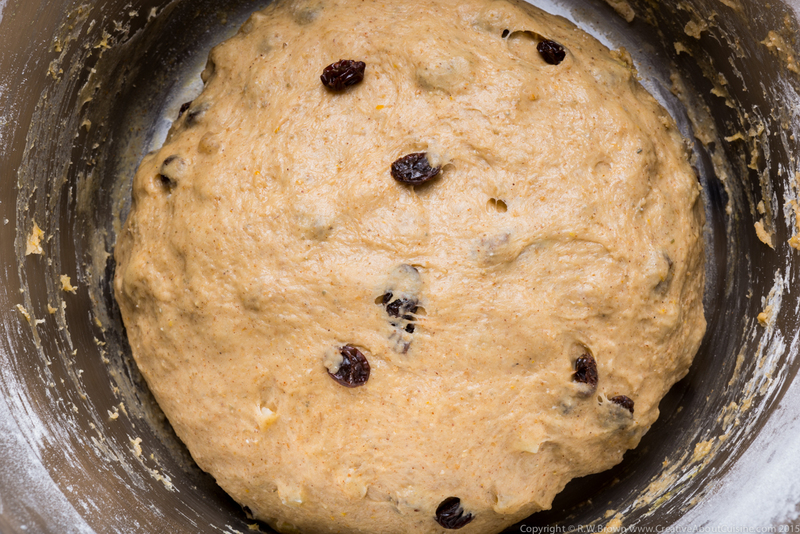 The dough will become less sticky as the gluten develops. 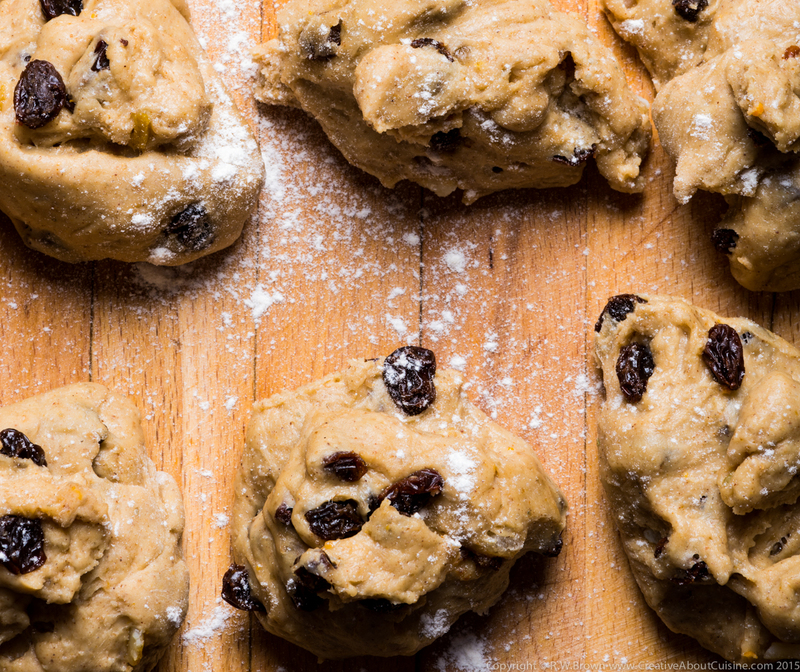 Once kneaded, place the dough in a bowl, brush the surface with a little oil or spray with culinary oil spray. Cover with clingfilm and leave somewhere warm to prove until doubled in size. Tip the dough out onto a lightly floured surface and using the plastic dough scraper divide into 16 equal pieces. 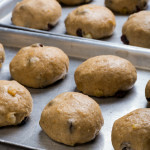 Form into balls and place on an oiled baking sheet about 1.5cm apart. Cover with clingfilm and then a tea towel. Leave to prove until roughly doubled in size. The buns will probably have started to join together at this point. 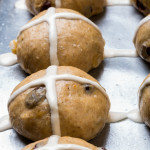 Beat the paste for the crosses and transfer to a piping bag with a fine tip. 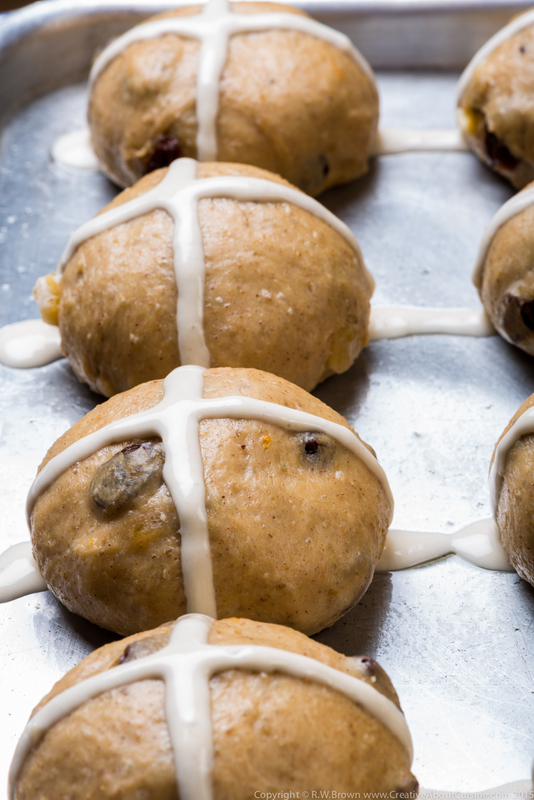 Pipe the paste across each row of buns allowing it to go down the sides, turn the tray and repeat to form the cross. 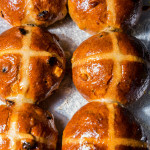 Bake the buns at 180℃ in a fan oven for around 20 minutes. They should be well-risen, firm and a deep golden brown. A baking tin in the bottom of the oven can have cold water poured into it at the start of baking to create some steam. Put this tin in when the oven is preheating. 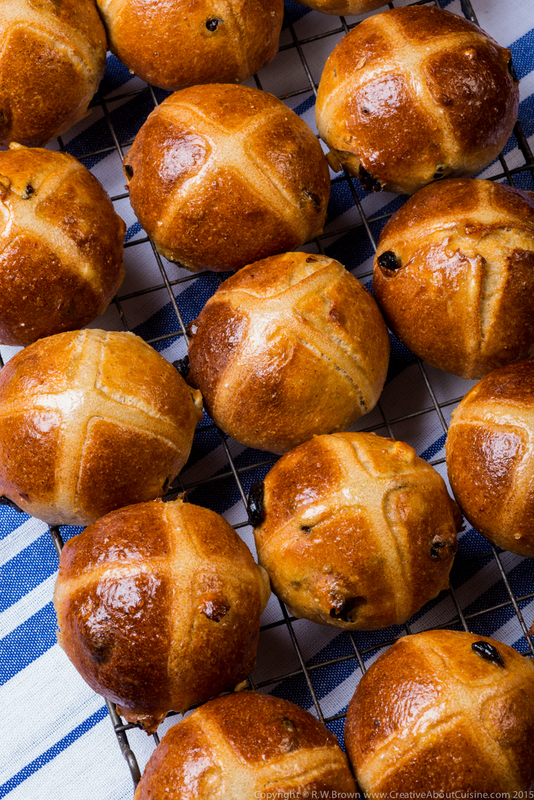 While the buns are cooking, melt the jam and marmalade for the glaze in a small saucepan or a bowl in the microwave. 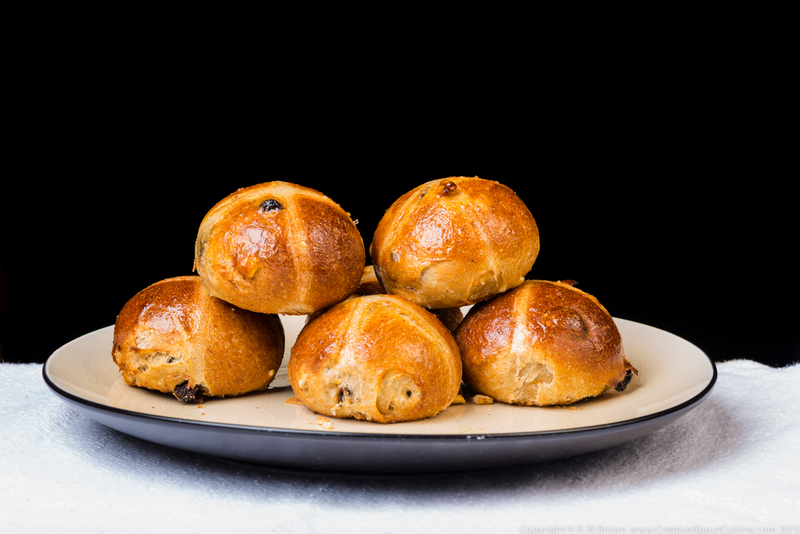 Using a pastry brush, coat the hot buns generously with the glaze. 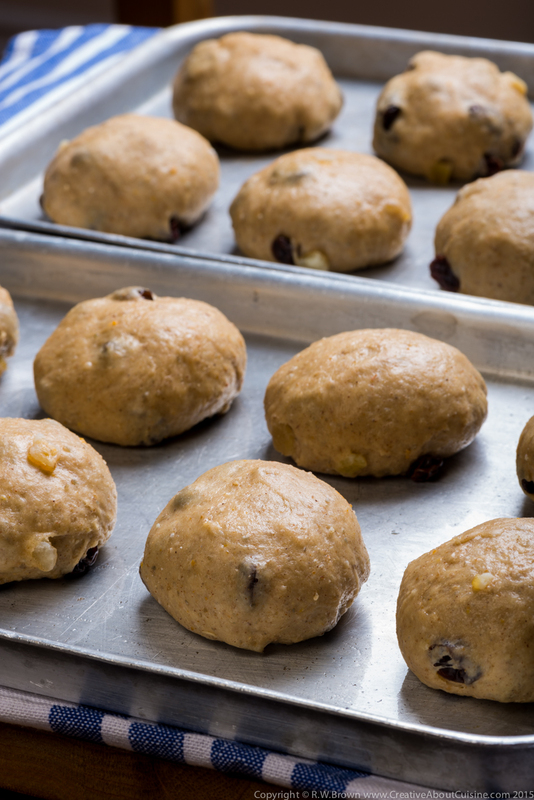 Place the trays on a cooling wire and leave the buns to cool. 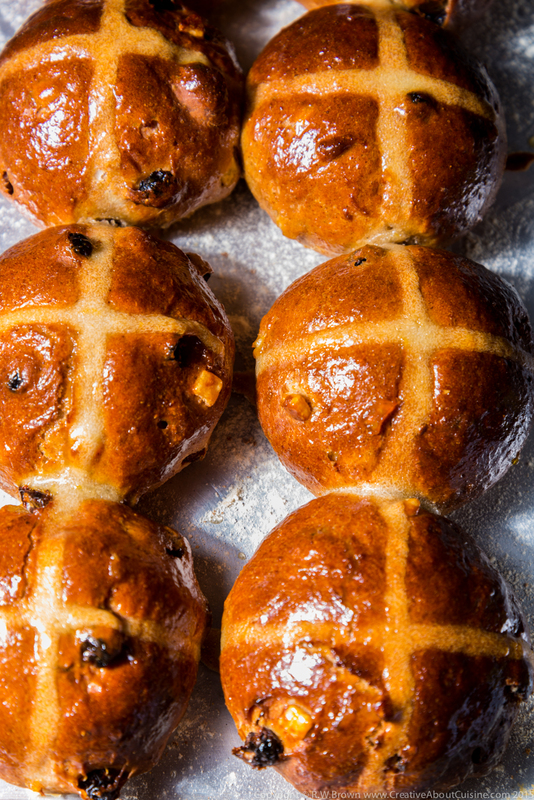 Leaving them on the trays tends to soften the bottom of the buns slightly so if you prefer a crisper finish slide them straight onto the cooling wire. You can download the recipe as a pdf here.